Peachtree Christian Health is the recipient of abundant blessings and is grateful to the many individuals and organizations who share their time, talent, and treasure with us so we can provide exceptional care and support to the caregivers, participants, guests, and families we serve. 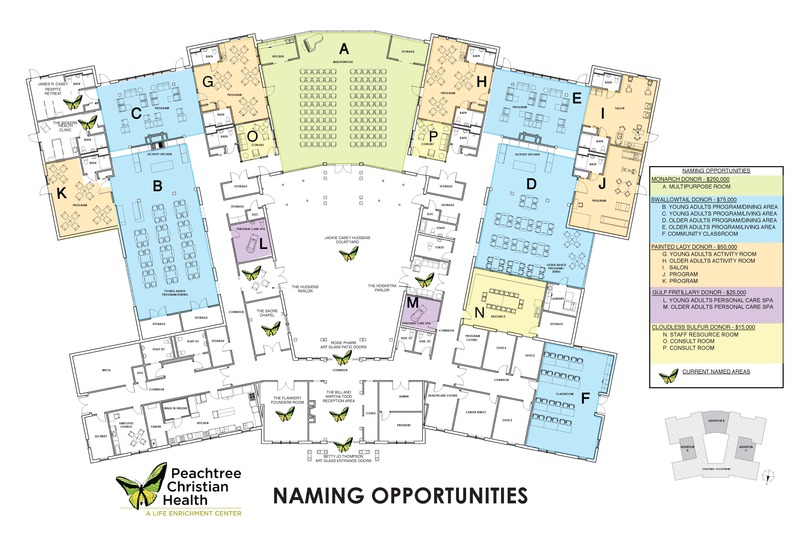 Peachtree Christian Health is excited to share the floor plan for the Life Enrichment Center opening in Spring 2019! Make a meaningful difference by considering one of our naming opportunities. For more information, contact Anne Mancini, President (amancini@pchlec.org) or Christi Heidt, Director of Community Relations (cheidt@pchlec.org). The Peachtree Christian Health Life Enrichment Center is always in need of individual, family, community, and organization volunteers to help us accomplish our mission to serve caregivers and their disabled and aging loved ones. Since the health challenges of our participants and guests often limit their social participation, having our ‘Friend’ volunteers welcome, visit, participate, and assist is vital to helping us keep them connected to their community. Please consider joining us as a ‘Friend’ volunteer. We know your time is valuable, so we will work with you and your interests to make sure that your time here is meaningful and purposeful in enriching your life and those of our participants, guests, caregivers, staff, and family members. Peachtree Christian Health is always in need of you or your group’s special talents. As part of our weekly program efforts, we welcome community individuals and groups to our Life Enrichment Center so that our participants, guests, and families can experience events and participate in opportunities that they otherwise could not. If you or your group has a special talent or ‘show’ (art, music, horticulture, drama, etc.) that you can share with our participants, please contact us for more information and to schedule. 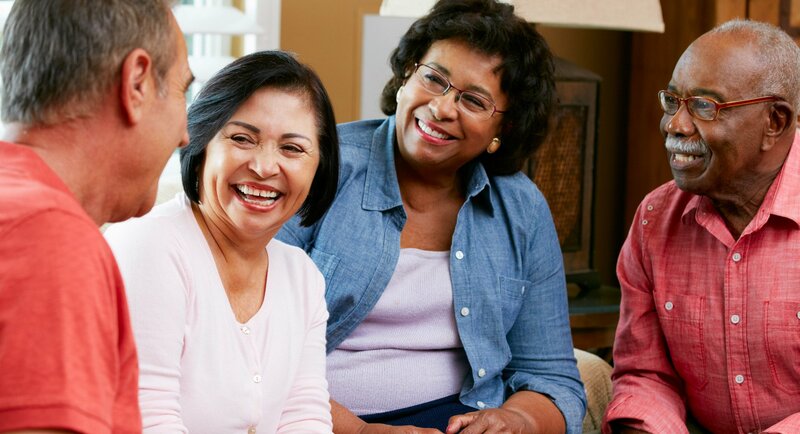 Another part of our mission is to provide resources, information and assistance to caregivers and individuals faced with health challenges and disabilities. Our ‘Partner’ volunteers offer specialized knowledge, compassion, and resources to help families, caregivers, and individuals navigate through their particular situation. If you are interested in assisting as a ‘Partner’, we will match your skills, experience, and background in related programs and opportunities. Please contact us to learn of all the opportunities to share your talent with the community. For volunteer information and application email cheidt@pchlec.or or call 678-374-1284. As a non-profit organization, Peachtree Christian Health relies on generous charitable gifts from benefactors to advance our mission to support caregivers and their loved ones by providing a compassionate care center offering safe, engaging, and reliable adult day services. We offer many opportunities to make financial gifts in meaningful ways. Peachtree Christian Health is rooted in 19 years of extraordinary care to individuals and their families. It is in gratitude of this compassion and care that families often wish to make a gift in honor or in memory of their loved one. Gifts can be made to our Heart2Heart Services or to our Unrestricted Giving Funds which benefits our New Beginnings and general organizational needs. For memorial and honorarium gifts, you will receive a gift recognition letter from our office and the family will be notified that a gift was received. Through Heart2Heart, Peachtree Christian Health has a Veterans Victory Garden Pavers Program. This program provides an opportunity to recognize veterans and their families by honoring your loved one through the purchase of a commemorative paver in the Peachtree Christian Health Veterans Victory Garden. The cost is $100 for a 4″ x 8″ paver with 3 lines of engraving/16 characters per line. Peachtree Christian Health sponsors two major fundraising campaigns throughout the year. Proceeds from these events go directly to fund the programs, services, and scholarships for our ministry. This year Peachtree Christian Health will offer the VIP Prelude Party on June 1, 2019 and the ‘Bill Todd Memorial’ Golf Classic on September 9, 2019. We are most grateful for your participation, sponsorship, and support of these two important fundraising events that help our caregivers and their families know they are never alone. We also appreciate your gift of stocks, bonds and cash donations. If you need assistance, please contact Christi Heidt at cheidt@pchlec.org or call her at 678-374-1284. Thank you for your support.